Their disappearance becomes international news, and theories as to their disappearance grow as wild as that of the original Dyatlov hikers: magic, aliens, or a thin membrane in the fabric of time and space that leads to another world. Their footage is found (making this one of the few “found footage” movies to take the name of its subgenre quite so literally), and although the Russian government attempts to suppress it, a hacker group steals it and releases it. Arriving in Russia, Holly’s crew interviews Alya, one of the searchers who found the bodies in 1959, who describes the scene with such lovely terms as “a trail of organs.” The most disturbing part of her description, though, is that the rescuers found 11 bodies, not the nine that have always been reported. As they march into the mountains, they begin finding unusual phenomenon, such as a trail of enormous footprints made by what look like human feet in far colder temperatures than anyone could stand being barefoot for more than a few minutes. They start to hear things, then find an old weather station with a human tongue. Jensen breaks down, and as Holly tries to comfort him, a pair of creatures run past in the distance, unseen by the crew, but captured on camera. Arriving at Dyatlov Pass, the crew marks the spots where the bodies were found and Holly describes their deaths for the camera – all dead of hypothermia, but all suffering assorted injuries as well. Exploring the area, Holly and Jensen find a metal door buried in the snow. In the night an avalanche destroys the camp, killing Denise and breaking Andy’s leg. Jensen is convinced that someone set the avalanche on purpose to dispose of them. They think they’re saved when a pair of hikers arrive, but they shoot JP. Forced to leave Andy behind, the others make it into the door. They follow a long tunnel underground, ending in a lab (Of course it ends in a lab) which has been utterly trashed, although the light bulbs still seem to work. They find photos of the old Philadelphia Experiment, an American teleportation project that went terribly wrong. JP is attacked and consumed by a pair of the creatures – ugly, emaciated, twisted people who contort in weird shapes and seem to blink in and out of existence. They find a tunnel that looks like some sort of hole in time (it actually looks really cool, I can’t think of a better way to describe it), and Jensen speculates it’s where the creatures originated from, that similar portals could be responsible for unexplained phenomenon around the world. Trapped, he convinces Holly to try to use the portal to teleport to safety. They wind up on the side of the mountain, but in 1959, where their bodies are collected by the Russian military and brought down into the lab (along with Holly’s camera). They hang Holly and Jensen’s bodies on hooks below ground, and we see them mutating, becoming two of the creatures that stalk Dyatlov Pass. Thoughts: A lot of people have an irate, visceral hatred of “found footage” movies, as if there’s nothing good that can be done with the genre. This is pretty short-sighted to me. Sure, there have been tons of crappy found footage movies, films that try to use shaky cameras to cover up bad special effects and cheap budgets, but then you get something like the magnificent Chronicle, and the form pretty much justifies itself. 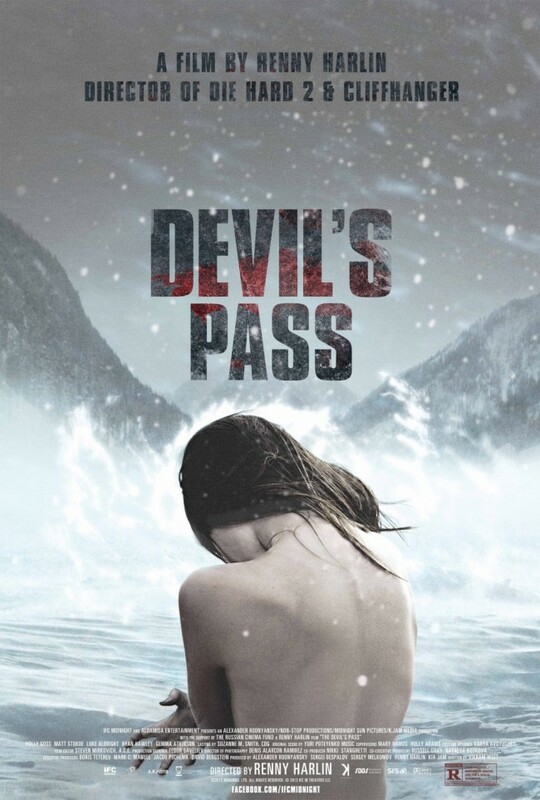 For the most part, Devil’s Pass is much more entertaining than the average found footage fare. Unlike the bulk of such movies (set in the woods or caves or similarly dark places), this movie is set in a snow-covered mountain range. It gives it a very distinct visual appeal, much clearer and cleaner than most found footage films, and the stark white vista is far less forgiving of cheesy camera stunts. When there are camera tricks – at several moments the picture bounces and glitches – it’s almost always done to signify that the crew is near the otherworldly creatures, even though they’re unaware of it. The big night scenes, such as the avalanche, are actually really effective, as the slow crumble of the snow down the mountain turns into a wave. Denise’s death is even cool – she slides directly into the camera, which in this movie is literal, her head cracks the lens when she crashes into it. The movie even addresses the usual “why the hell are you still filming this?” question that found footage falls prey to – Holly explicitly says that she wants a record of what happened, no matter what, so that they don’t wind up as another Dyatlov mystery. It didn’t lose me, not as badly at least. Bad computer graphics aside, I think Devil’s Pass has a lot going for it. It avoids a lot of the tropes that damn bad found footage movies, and at the same time has a fairly clever storyline that pokes a hole into actual history and mixes it with a very healthy formula of science fiction and horror. While it isn’t going to be remembered as one of the all-time greats, and it’s not a movie I picture myself watching over and over again, it’s an enjoyable way to spend 100 minutes and worth taking a little time on.